Lawmakers, including 12 Republicans, had passed the rejection resolution on Thursday in a surprising rebuke of Mr Trump’s pledge to build a border wall. Congress will now need a two-thirds majority in both chambers to override him, which is unlikely to happen. This is the first veto of Mr Trump’s presidency. “As president, the protection of the nation is my highest duty,” Mr Trump said on Friday. Standing behind the president were law enforcement officials and “angel parents” – the parents of children killed by illegal immigrants. “Yesterday, Congress passed a dangerous resolution that if signed into law, would put countless Americans in danger. Mr Trump repeated his claims that illegal immigrants from the southern border were mostly criminals, bringing drugs into the country. He had promised a veto of the resolution ending his emergency declaration as soon as the measure was circulated on Capitol Hill. The Democratic-controlled House of Representatives had passed the resolution to overturn the emergency last month, and 12 Republicans sided with Democratic Senators to clear the Senate in a 59-41 vote on Thursday afternoon. The renegade conservatives had condemned the emergency declaration for setting up a dangerous precedent for a president while emphasising that they still agreed with Mr Trump’s tough border security policies. 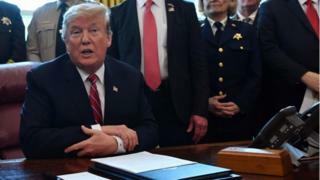 Mr Trump had declared the emergency in February after Congress refused his requests for $5.7bn (£4.4bn) to construct a border wall – a campaign promise. By doing so, he opened up access to billions in military funds that do not require approval from lawmakers. Democrats – and a handful of Republicans – were quick to label the move presidential overreach. The president has maintained that the situation with migrants at the southern border is a national security and humanitarian crisis, while Democrats have accused him of fear-mongering. Following the veto, the resolution will return to the House. While Democrats control the House, they would need a total of 67 votes in the Senate to override Mr Trump’s veto. Given that only 12 out of 53 Republicans joined them to pass the initial resolution, it is unlikely that any override measure will be successful.